In celebration of the cafe's 11th birthday, everything from its vegan waffles to its corn fritters and avo on toast will be $11 right up until December 31. All birthdays require some sort of celebration — it's the rules. Whether your idea of a celebration is a round of tequila shots, a weekend away, or a nice cup of tea a Woolies chocolate cake, it's the one day of the year you can do you and no one can even begin to begrudge you for it. Hawthorn's Muharam is certainly taking that to heart this year — the cafe is celebrating its 11th birthday in 2018, and it's decided to throw a bit of an all-year shindig to mark the occasion. Eleven years of going strong means that it's doing its regulars a solid, slashing everything on the menu down to a mere $11. That's right, approximately the price of three x lattes, one x fancy green juice, or half x the smashed avocado tomfoolery. And it's not just running for a day, or even a week — it's on offer until the end of this year. Yep, everything on the food menu will be just a blue note and a coin until December 31. Definitely doable on a Sunday morning — even if you've spent pretty much everything else in your wallet the night before. So what can you get for your 11 bucks? 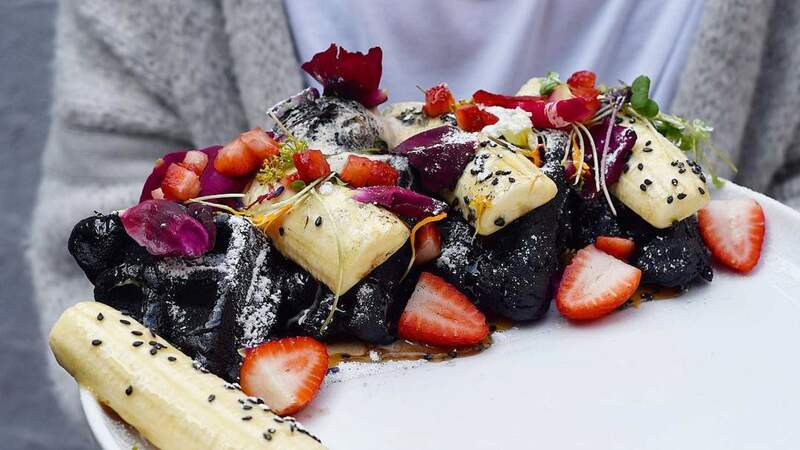 The menu includes red velvet pancakes, spiced corn fritters with avo and bacon, and an acai smoothie bowl. The real star of the show might just be vegan black buckwheat waffles with activated charcoal, maple glazed banana, pitaya cashew cream and pistachio crumble — which is basically $1 per ingredient, so you've no good reason to not get yourself to Muharam immediately. You're welcome. Muharam is located at 97 Burwood Road, Hawthorn and is open for breakfast and lunch seven days a week. For more info, visit muharam.com.au.